September 1980. The biggest UK news since the last blog entry is the Conservative victory in the April 1979 General Election and Margaret Thatcher’s subsequent appointment as Prime Minister. Meanwhile, Graham Williams has resigned as Doctor Who’s producer at the end of Season 17 and recommended that his Production Unit Manager John Nathan-Turner be appointed his successor. Both Nathan-Turner and Thatcher will remain in place throughout the 1980s, and it’s still even money as to which of them is more reviled in fandom. But back in 1980, as Thatcher’s popularity started to wane – prompting her to make the famous “lady’s not for turning” speech at the Tory conference – Nathan-Turner’s star was very much in the ascendant and he was keen to make a very public mark on the show, which is perhaps clear from the fact that he immediately arranged for this, his first story to be covered in the book A Day in the Life of a TV Producer. The changes are indeed evident from the off as the new arrangement of the theme music and the opening starfield titles arrive with a scream. It’s the first substantial change to them since 1973, and works quite well as a statement of intent. 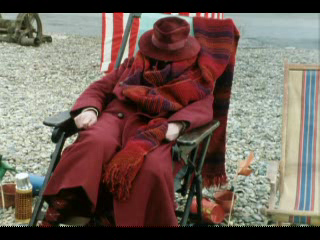 Sadly, it’s immediately followed by a long and rather dull sequence of the Doctor snoring in a deckchair on a dreary beach, which undermines the energetic new credits. But after a little gentle nagging from Romana, and a couple of continuity references to Horror of Fang Rock and The Armageddon Factor, the Doctor decides to rouse himself and take the TARDIS to the famous Leisure Hive of Argolis. Unfortunately, in the first of the boardroom scenes that dominate The Leisure Hive, we learn that “Argolis is out of date”, struggling to compete with new and exciting leisure planets like Limnos IV and Abydos. I’m not quite certain whether this is meant to be a sly dig at Nathan-Turner’s sponsor, the ex-producer, but if so it’s rather misjudged given Season 17 attracted audiences of over 10 million, and in the face of stiff ITV competition from Buck Rogers in the 25th Century this story struggled to achieve half that. Sadly, anti-gravity swimming pools and robotic gladiatorial games do indeed sound more exciting than Argolis’s science of tachyonics which, we’re solemnly told, “remains, after 40 years, little more than a curiosity.” More interesting is the rather neat hologram pyramid in which the extravagantly-coiffured Argolins communicate with their travel agent on Earth, Mr. Brock (presumably so named because he resembles a badger). So far, then, Nathan-Turner’s new approach is already foundering in a couple of turgid sequences of exposition, with talk about agents, lawyers, investments and directorships. It’s Howards’ Way in space. Meanwhile, on ITV, Buck is visiting the Planet of the Slave Girls. A nation drags itself off the sofa and reaches out its hand to switch to the other side. Then the TARDIS arrives in an audacious moving shot, making full use of the astonishing abilities of the Quantel machine. The hand pauses for an imperceptible moment, then switches over anyway. Which is a shame, because after this disastrous opening, The Leisure Hive starts to buck (sorry) its ideas up and develop into something that, although hardly dynamic, is at least quite interesting. Pangol’s terrifying declaration that “For the next hour and half we will examine the wave equations that define the creation of solid tachyonic images” is an empty threat. Instead, we’re treated to a story that’s all about artifice, false impressions and misdirection. That’s clear when the Doctor and Romana declare the Earth scientist Hardin’s rejuvenation demonstration to be a special effect, and it’s clear when Pangol discloses the tricks of the recreation generator. Later we’ll learn that a number of characters are not at all who they appear to be. There’s even a cheeky nod to Doctor Who’s own ropey effects as the Doctor and Romana float, via the magic of CSO, past a zero-gravity squash game and the Doctor, sporting a chromakey fringe, declares, “I noticed vague interference patterns.” The first episode ends with a clever cheat – the Doctor being ripped apart in the manner of an earlier victim of the recreation generator, his face and scream mixing into the Doctor’s face and the scream of the end credits. But how strange that the episode should save all its neat tricks for its end rather than hook viewers at the beginning. Part Two is more of the same – more tiresome boardroom scenes enlivened to an extent by the sweet romance between Hardin and Argolin matron Mena, a rare cross-species dalliance. Mena’s fate – her withered seeds dropping off her hair pod in a forlorn metaphor for the Argolins’ sterility and rapid ageing – is nicely handled, and Adrienne Corri really sells Mena’s increasing decrepitude and desperate attempts to prevent the extinction of her planet. The second episode sets up the idea that someone is trying to sabotage the Hive, and there’s even a scene which is explicitly referenced by Russell T Davies, when someone opens a cupboard to discover a human skin-suit that’s been designed to fit over a much larger, pot-bellied lizard. But the big problem is, it’s not really clear what we’re supposed to be concerned about: is the main plot the death of Argolis, or the boardroom squabbles over the Hive’s future, or Hardin’s time experiments? All these events are, of course, connected. But none is developed in a way that’s likely to linger much in the imagination or appeal to an audience being tempted by Buck’s Planet of the Amazon Women. Instead, all the effort seems to be going into the visuals. Which is perfectly understandable, given that the consistent failure of the Williams shows was their design. June Hudson, the star costumier of the last season, has been drafted in to dress the Argolins in splendid canary robes, Tom Baker in rich claret and the Foamasi in iridescent green. Dorka Nieradzik’s make up design, particularly for the aged Mena and Doctor, is superb. Lovett Bickford’s direction – all close ups and sudden reverse shots – is showy, and the sets, while not a million miles away from Season 17’s, are pleasingly solid, with ceilings and everything. Argolis might look superficially like Skonnos, with its swirling crimson atmosphere, but it’s a more substantial environment. But, here, this improvement seems to be at the expense of a clear and compelling story. The cliffhanger to Part Two is fantastic – the Doctor aged 500 years – but nothing is really done with the idea. Other than making Tom Baker’s Doctor seem more vulnerable than before – which is also the point of the first cliffhanger – it doesn’t really make any difference. If Graham Williams’ mantra was “It’s all about telling stories. Nothing else matters.” John Nathan-Turner seems equally fixated on the cosmetics, the headline-grabbing moments, the gimmicks, even if they come at the expense of making a coherent programme. Part Three introduces the idea that Pangol is the vanguard of a brash new future dominated by science and technology, keen to usher in the death of the embarrassing old Argolis with unseemly haste. I imagine the analogy was entirely lost on Nathan-Turner and his new script editor Christopher Hamilton Bidmead, so keen to trash the past and set the series on a path to a bright future of solid science fiction and question mark collars. The Leisure Hive is, like Pangol, the herald of the future, a new way of making Doctor Who. And like Pangol, it was probably a necessary survival tactic. But that doesn’t actually make it any good. Like so many of Nathan-Turner’s stories, The Leisure Hive is best enjoyed for some of its wonderful images: the ancient Doctor emerging from the recreation generator; the hourglass running backwards; the Doctor being torn, limb from limb. All of these are in the finest tradition of a show that’s built around iconic moments. Appreciated as a statement of intent, an experiment with a new style of making the programme, this is understandable. As a precursor to Season 18’s obsession with old men and entropic planets, it’s prescient. As a Doctor Who story, it’s something of a curate’s egg. But let’s cut The Leisure Hive some slack. Nathan-Turner might not have nailed it first time, but neither did Hinchcliffe or Williams. With its mixture of Christopher Hamilton Bidmead’s façade of technical credibility, Lovett Bickford’s extravagant direction and Nathan-Turner’s hyperactive focus on making the show look distinctive and different, there is nothing else quite like The Leisure Hive in the whole of Doctor Who. And after 50 years that’s quite an achievement. Next Time: “The Doctor’s darkest hour. He’ll rise higher than ever before and then fall so much further.” It’s Logopolis.